Before Rocklin’s Homecoming dance Sept. 29 Whitney students Ryan King, Bryce Simpson, Daniel Parker, David Brosnan and Bennett Woodward pose with Rocklin student Quincy Dungan. Photo by Adriana Williams. 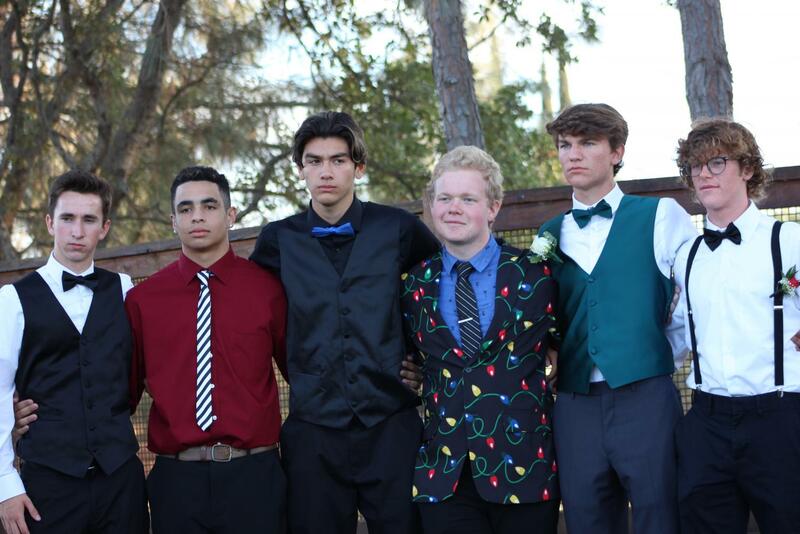 Rocklin High School’s Homecoming, Sept 29, had a significantly large amount of Whitney students in attendance, due to the number of friendships between the two schools. Homecoming is a major high school event, from getting ready, the pictures before, going to dinner, the actual dance, and the after parties. It is a day and night event that can serve as an opportunity for old friends to catch up and to meet new people. “The dances have helped me maintain my friendships with my middle school friends,” Kate Jara said. Whitney and Rocklin dances are very similar. Both dances are filled with people and effects throughout the night, such as balloons falling from the ceiling and giant beach balls floating through the crowd. “Rocklin’s Homecoming had a punch bowl, that blew my mind,” Caleb Noonan said. At Rocklin, the dances are normally more packed, since all the people are in one gym instead of having separate dance floors. At both schools, a DJ handles the music to increase the energy in the crowd and keep everyone up on their feet dancing. However, Rocklin’s Homecoming took a new tactic by featuring a teacher blasting the students dancing with smoke to keep them pumped up. For the Homecoming dance here on Oct. 13, ASB planned a spooky twist to the night. The dance theme is going to be Haunted Homecoming with dress-up days and lunchtime activities throughout the week, to try to get everyone excited for the dance. “Everyone knows the basics of Halloween, so it will be easier to participate,” ASB president Ava Jeung said. Around 1200 students attend this event yearly and it is common for some people to invite their friends from across town. It is a good time to connect students from “rival” schools and to make new bonds and memories.